Blessed William Joseph Chaminade encourages us to be, "... the most faithful imitation of Jesus Christ, Son of God." Shortly after Thomas Merton converted to Catholicism in the late 1930s, he was walking the streets of New York with his friend, Robert Lax. Lax was Jewish, and he asked Merton what he wanted to be, now that he was Catholic. “I don’t know,” Merton replied, adding simply that he wanted to be a good Catholic. Lax stopped him in his tracks. Thomas Merton knew his friend was right. Merton, of course, would go on to become one of the great spiritual thinkers and writers of the last century. His friend Bob Lax would later convert to Catholicism himself -- and begin his own journey to try and be a saint. But the words Lax spoke ring down through the decades to all of us today. Because they speak so simply and profoundly to our calling as Catholic Christians. You should want to be a saint. And to be one, all you need is to want to be one. Of course, if you only want to be a run-of-the-mill, average Christian, that’s probably all you’ll ever be. Every one can do just enough to get by. It’s not hard. Most of us are familiar with the phenomenal saintly stories of the Church. 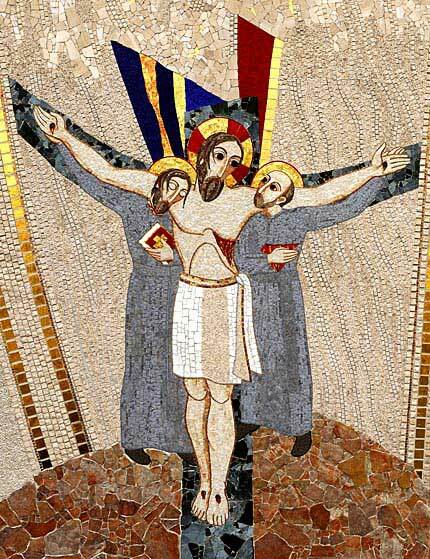 We grew up hearing of how John was beheaded, and Stephen was stoned; how Francis got the stigmata, or how Therese suffered humiliations and disease to die an early death. You hear stories like that and you can’t blame Thomas Merton for not really being eager to be a saint. It’s not only hard work, it often doesn’t have a happy ending. But those are the stories we hear about. There are countless stories – millions, throughout the centuries – that we don’t. They are the anonymous saints who go about their daily lives quietly, peacefully, joyfully, finally entering into the fullness of grace without doing anything more dramatic than merely living the beatitudes. They are the unsung saints. 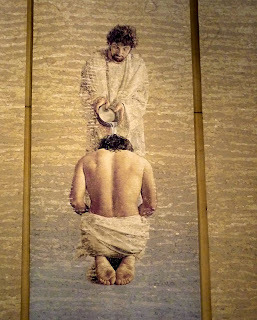 In the Cathedral of Our Lady of the Angels in Los Angeles, you’ll see magnificent tapestries lining the walls. And they really are magnificent, designed and executed by the artist John Nava. In the tapestries, you can see all the familiar saints whose names we know, in a row, facing toward the altar, as if in line for communion. It is – literally and figuratively – the communion of the saints. There is St. Nicholas, St. Gregory, St. Thomas Aquinas, St. Francis, St. Clare…and on and on, with their names over their heads. But scattered among those saints are people without names – people you won’t find in Butler’s “Lives of the Saints.” A teenage girl. A young man from the barrio. Children in contemporary clothes. They are the saints whose names are known only to God. It is a beautiful and eloquent depiction of the day we celebrate today: All Saints. And the message of those tapestries is the message of this feast day: these unknown saints are just as worthy as they ones who are known. They look like us. They look like people we might pass on the street. If they can be holy, can’t we all? What does it take to join them? All you really need… is to want to. And God will do all the rest. Now get yourself ready for a great Irish dance takeover of the world. Suzanne Cleary and Peter Harding, alumni of the Broadway hit "Riverdance," decided to take to the interwebs to spread their joyous take on Irish dancing with their two-person troupe Up & amp; Over It. Filmmaker Jonny Reed creates the playful films to promote the new take on the historical dance form. So far they've made seven films and plan to take their show on the road next year. It will be a combination of film and dance. Time to settle down and reflect on this week's Scriptures for the 31st Sunday in Ordinary Time. Jesus makes it clear that it is wrong to side with privileged persons, those who "tie up heavy burdens, hard to carry, and lay them on people's shoulders" ... those who "do all their deeds to be seen by others" ... those who "love to have the place of honor at banquets and the best seats in the synagogues, and to be greeted with respect in the marketplace." When it comes to justice, we Christians cannot be on the side of the privileged, nor can we say we are neutral on the issue. Bishop Desmond Tutu of South Africa said, "When the elephant has his foot on the tail of the mouse, and you say you are neutral, the mouse will not appreciate your neutrality." Nor will the burdened vessels of this world. In every place and in every time, Christ's dsiciples are called to do what they can to relieve the burdens of people around them. Fr. Robert Barron, professor of systematic theology at the University of St. Mary of the Lake/Mundelein Seminary in Mundelein, Illinois has spent the last several years working on the Catholicism Project. The purpose of this project is to present the story of the Catholic Church on its own terms by bringing viewers to the places where the Catholic story has taken place over the last two millennia. The 10 part video series, which I began viewing this week, has been a labor of love for Fr. Barron. We’re fortunate to be living in the time of this new evangelization that Blessed John Paul II spoke of, where the power of new media can help Christians spread the message of Christ to greater audiences than ever before. We are thankful for the tireless work Fr. Barron is doing and I hope you’ll take a few minutes to check his work out too. What do you know about Our Lady of the Pillar? Have you heard of her? Except for Hispanic peoples, especially Spaniards, and lovers of Hispanidad, she is most likely not as widely known as the Blessed Virgin Mary of other famous shrines. Yet her story predates the Gospels and was told long before the Gospels were written. This is an interesting story, seemingly unbelievable, about Mary’s first apparition in history. The tradition tells us that seven years after the death of Jesus, on January 2, 40 AD, the Apostle St. James the Elder, brother of St. John, sat tired and disappointed by the bank of the Ebro River in what is now Zaragoza, Spain. The people of the Roman province of Hispania (Spain/Iberian Peninsula) were not open and receptive to the Good News of Jesus, and St. James was ready to give up his efforts to evangelize them. On that January day the Blessed Virgin Mary, still living in Palestine, appeared to James atop a column or pillar of stone. With encouraging words, she assured him the people of Hispania would become Christians and their faith would be as strong and durable as the pillar on which she stood. To remember the visit and promise of the Virgin Mary, the first Marian shrine was built around the pillar, and James began to convert the pagans of early Spain. Many will automatically think this is just another pious myth among many Catholic legends and an interesting story for tourist guidebooks, or another excuse for celebrating a weeklong fiesta around the time of the Feast of Our Lady of the Pillar, which is celebrated on October 12. Some will suspect this is simply another occasion for selling glitzy, chintzy Marian souvenirs. Why would an enlightened person of this modern era believe such a story? Yet, neither natural nor religious reasoning has been able to discredit and discard the story of Mary of the Pillar and relegate her to unbelief and something unworthy of genuine devotion. On the positive side, it is interesting to note that the German Augustinian stigmatist and visionary of the early nineteenth century, Blessed Anne Catherine Emmerich, comments on Mary of the Pillar’s appearance to James. With rich detail she describes the Zaragoza event in chapter 14 of The Life of Our Lord and Savior Jesus Christ. Some, even with scientific reasoning, might dismiss any claims of sincere devotion of Marian devotees. The story of Our Lady of the Pillar does seem unbelievable, unless you grew up with it or have an unshakable faith. Anyone who was raised in Zaragoza or somewhere else in Spain, anyone who has grown up knowing Our Lady of the Pillar, is intimately linked to her as any Mexican person is to Our Lady of Guadalupe, or any Irish Catholic is to Our Lady of Knock. The same is true of Lourdes and the French, or Fatima and the Portuguese, or Czestochowa and the Polish. For devotees of these and other Marian apparitions, Mary is not only the Mother of Jesus and of the Church but also their mother—and our mother. Some might even be lapsed Catholics, but they will at least once a year on her feast day visit her church or pray to her. Our Lady of the Pillar has a special place in the lives of many, not the least of which are those who bear her name. In Spain and in Latin America the name “Pilar” is commonly given to girls at Baptism. At one time in Spain almost everyone wore a medal of Nuestra Senora del Pilar. Our Lady of the Pillar is also immensely important in the history and mission of several religious congregations and movements, especially the Marianist Family, founded by Blessed William Joseph Chaminade. Her special relation with Hispanic America results from Columbus’ discovery of America on October 12. Devotion to Mary is something that cannot be dismissed simply with psychological and sociological explanations. This devotion goes beyond collective pride, national identity, and the need to belong. It is something more mysterious, something that transcends time, cultures, and even reason itself. We learn to live with the seeming contradiction between reason and faith, between believing Mary is our mother and thinking all this is unbelievable. After all, faith is about love, mystery, and life. And those are real, even if we cannot understand them. Just because we do not fully comprehend all this and cannot fully explain it, does not mean it does not exist. Let the thought and the image of Our Lady of the Pillar be a forceful reminder that we walk in the footsteps of St. James and the early Christians of Hispania in following Christ. May she be for us a pillar of faith. Here in South Bend, people get pretty pumped over Notre Dame football. They dress in blue and gold, paint their faces, prepare food all night for the tailgates, even get up early. When the game starts, the crowd goes nuts! Cheers. Standing. Sitting. High fives to strangers you don’t know. We are fully engaged in the event. I wonder what would happen if we participated with the same heart and passion at Mass on Sunday? Let’s be honest. Mass … it’s boring, right? Growing up, that’s what I thought. In grade school, we went to daily Mass, while wearing ugly, green, plaid uniforms, with an old lady playing the organ. At that point, I would rather watch paint dry. “Do you know what is happening at the Mass, Mary?” he said. “The veils of heaven are lifted, and the offering given 2000 years ago on Calvary becomes present on the altar.” We the church, offer ourselves at Mass (as a living sacrifice) back to God. And we receive His body and life, to be sent out into the world. “What!!?? ?” I was so blown away I almost dropped my bowl of mac and cheese on the floor. Why didn’t anyone tell me! Mass is a sacrifice!? How did I go through 14 years of Catholic education and never know what was happening at Mass? My eyes were opened that day. That year in college was a year of great conversion. I fell in love. I began to listen to the words at Mass. “Lamb of God who takes away the sins of the world, have mercy on us” … “All the angels cry holy, holy, holy” … The mysteries of Mass came alive for me. I started reading early church history and Scott Hahn’s book “The Lamb’s Supper.” I was forever changed. Mass is not boring — it’s the most exciting mystical event we can encounter. But like a ND football game, (or anything else in life) you get out of it what you put in. And Mass is not meant to be lived on the sideline — it is a full (heart-body-mind) contact sport. So here are some helpful tips! Take the time to learn about the Mass. What is happening and why. The incense and rituals are not there just “because” some old guys wanted to make your Easter Vigil as long and as painful as possible. Catholicism is a very sensual (as in we use our senses) religion. We use smell, sound and touch in the sacraments to encounter God. Why and How? Because the invisible God makes himself visible. (God became man) Through humanity and sacraments, (through water, oil, and bread) God uses the visible world to reveal and encounter invisible mysteries. It’s pretty cool stuff, if you ask me! Read the scripture readings before Mass. You can get them online, (check out Mark Hart’s Sunday podcast), download an iphone app, or subscribe to the Magnificat or DailyBread. It takes five minutes to read while you brush your teeth. This will help you to listen better for what God is saying to you through scripture. Usually when the readings start, we tune out. But listen. God speaks to us personally through scripture. Listen for what God is trying to say to you through the four readings at Mass. Try to connect with specific phrases or words that jump out to you: “Be not afraid” or “But you will receive power.” Sometimes the Lord gives us profound truths in small bites. Don’t just go through the motions. Mass is meant for full participation. Engage the mind. When we pray the intercessory prayers (example: praying for Haiti) I actually imagine the people of Haiti in my mind to make it real. Engage your heart. Pray the prayers, experience the words you are saying. They are powerful and real. Engage the body. Open your mouth and sing! Extend your hands back to the priest when you say “Peace also with you.” Mass is a full body sport. Because our bodies and souls make up our one being, we engage the mysteries of God in and through our bodies. After you receive the Eucharist (the body, blood, soul and divinity of God). Allow yourself to just be absorbed in His presence in you. Calm your mind, listen for God’s whisper, feel His love. That moment is the most intimate time you can spend with Jesus. There are two things that happen at Mass. Communio and Missa: two cool Latin words. “Communio” in Latin means communion (come to union). “Missa” is where the word Mass comes from and means to be “sent out.” Think of it like our lungs. We take in air (communio) and we breathe out air (missa). This is the process of our faith. We take in the word, prayer and the sacraments to fill and transform us. As we breathe in and receive God’s love, we can go out and live God’s presence in the world. This is what Mass is all about. In the end, I still wish some of the priest’s homilies were more relatable. I still wish my parish would break out with some cool praise and worship or Matt Maher music during Mass. And of course I still get distracted sometimes by the girl’s cute shoes next to me and the many to-do lists running around in my head. It's about time to ponder the Scriptures we'll hear proclaimed at Mass this weekend for the 30th Sunday in Ordinary Time. The thrust of Jesus’ comments on Sunday are directed to the assembled onlookers. Love God. Confused about how to do that? Love your neighbor. The law of love is a powerful force. When it’s embraced, and put into practice, personal relationships are affected and entire societies are transformed. It doesn’t really matter whether the love’s being expressed in a large family in Mineola, among the children of St. Martin de Porres school, in downtown Uniondale in these times, or among us today. In every time and place and situation, the practice of love of God and love of neighbor is going to have an impact on the world. So let’s get a helper’s high. Nothing wrong with that. But understand that this is about the nature of God and how deserving God is of our love. What better way to reach up and touch God than to reach down and touch the fallen, or to reach over and pull the alienated to ourselves, or to reach around and embrace someone who’s alone in the world. On Thursday evening the Pope formally opened the new Domus Australia shown at the left-- a former Marist house that will now serve as the pilgrim lodge in Rome. And this morning, the papal address to the bishops emphasized the life and witness of Australia's first saint, the recently-canonized foundress Mother Mary MacKillop (1842-1909). Today we celebrate another great saint of the Church. St. Paul of the Cross was a great mystic. His life was truly a life of reparation in all its depth and elevation; it was the apostolate by spiritual suffering to an exceptional degree. This suffering consisted not only in the subtraction of sensible consolations, but, as it were, in the eclipse of the virtues of faith, hope, and charity. The saint believed himself abandoned by God, he believed that God was irritated with him. His temptations to despair and sadness were overwhelming; and yet in this interminable trial, St. Paul showed great patience, perfect resignation to the divine will, and extreme kindness to all who approached him, as Father Cajetan relates.In the Summary of the ordinary processes in view of his canonization, are the following declarations: "One day St. Paul said to his director: 'If anyone should ask me at any time what I was thinking about, it seems to me that I could reply that I was thinking of God.' " This was likewise the case even in his greatest spiritual desolations, at a time when it seemed to him that he no longer had faith, hope, or charity. He was accustomed to say: "It seems to me impossible not to think of God, since our spirit is wholly filled with God and we are entirely in Him." Actually, when St. Paul of the Cross went through the streets of Rome exclaiming: "A via Pauli, libera nos, Domine," he was unable to breathe spiritually except in God. Day and night for forty-five years his prayer was a painful, heroic, incessant prayer, which sought God ardently, and which sought Him to give Him to the souls for whom this great saint suffered. More fruitful than years of preaching inspired by a lesser love, these painful years were a sublime realization of the Master's words: "We ought always to pray, and not to faint." The saint's life and trials throw light on the import of the following thought of St. John of the Cross: "A single act of pure love can do more good in the Church than many exterior works". Today we celebrate the North American Martyrs. Isaac Jogues and his companions were the first martyrs of the North American continent officially recognized by the Church. As a young Jesuit, Isaac Jogues, a man of learning and culture, taught literature in France. He gave up that career to work among the Huron Indians in the New World, and in 1636 he and his companions, under the leadership of John de Brébeuf, arrived in Quebec. The Hurons were constantly warred upon by the Iroquois, and in a few years Father Jogues was captured by the Iroquois and imprisoned for 13 months. His letters and journals tell how he and his companions were led from village to village, how they were beaten, tortured and forced to watch as their Huron converts were mangled and killed. An unexpected chance for escape came to Isaac Jogues through the Dutch, and he returned to France, bearing the marks of his sufferings. Several fingers had been cut, chewed or burnt off. 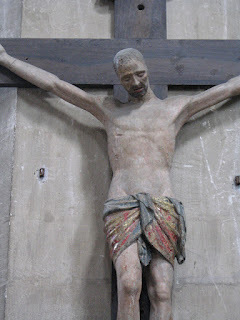 Pope Urban VIII gave him permission to offer Mass with his mutilated hands: "It would be shameful that a martyr of Christ be not allowed to drink the Blood of Christ." Welcomed home as a hero, Father Jogues might have sat back, thanked God for his safe return and died peacefully in his homeland. But his zeal led him back once more to the fulfillment of his dreams. In a few months he sailed for his missions among the Hurons. In 1646 he and Jean de Lalande, who had offered his services to the missioners, set out for Iroquois country in the belief that a recently signed peace treaty would be observed. They were captured by a Mohawk war party, and on October 18th Father Jogues was tomahawked and beheaded. Jean de Lalande was killed the next day at Ossernenon, a village near Albany, New York. The first of the Jesuit missionaries to be martyred was René Goupil who, with Lalande, had offered his services as an oblate. He was tortured along with Isaac Jogues in 1642, and was tomahawked for having made the Sign of the Cross on the brow of some children. Jean de Brébeuf (1593-1649): Jean de Brébeuf was a French Jesuit who came to Canada at the age of 32 and labored there for 24 years. He went back to France when the English captured Quebec (1629) and expelled the Jesuits, but returned to his missions four years later. 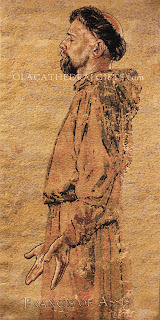 Although medicine men blamed the Jesuits for a smallpox epidemic among the Hurons, Jean remained with them. He composed catechisms and a dictionary in Huron, and saw 7,000 converted before his death. He was captured by the Iroquois and died after four hours of extreme torture at Sainte Marie, near Georgian Bay, Canada. Father Anthony Daniel, working among Hurons who were gradually becoming Christian, was killed by Iroquois on July 4, 1648. His body was thrown into his chapel, which was set on fire. Gabriel Lalemant had taken a fourth vow—to sacrifice his life to the Indians. He was horribly tortured to death along with Father Brébeuf. Father Charles Garnier was shot to death as he baptized children and catechumens during an Iroquois attack. Father Noel Chabanel was killed before he could answer his recall to France. He had found it exceedingly hard to adapt to mission life. He could not learn the language, the food and life of the Indians revolted him, plus he suffered spiritual dryness during his whole stay in Canada. Yet he made a vow to remain until death in his mission. These eight Jesuit martyrs of North America were canonized in 1930.
and to ponder all things in the light of revelation. and in the events of our daily lives. in his plan of salvation. Jesus was formed in her by the Holy Spirit. sharing in all his mysteries. he proclaimed her our Mother. You know when you find something and you can’t imagine your life with out it? For some of you that one thing is a relationship with a good friend, pet or a cell phone. This is a story about that; the one thing in my life that I can’t live without. I grew up in Marietta, GA and my family was not particularly religious. We went to a Methodist church on Christmas and Easter and on a handfull of Sundays. At that point the only thing that would make me appear to be a Christian was the fact that I celebrated Christmas, or rather I celebrated receiving video games and wool socks. I had fiends who were involved with Young Life and they invited me to different events with them. I had other friends who went to the youth group at a Baptist church and I would go with them to events. My sister, who was in college at the time, invited me to go to the church she was attending, North Point Community Church on Sunday mornings when she was in town. Looking back at that point in my life, I can see that God was quietly saying, “Follow Me” through all my friends and my sister. There was a point at the end of my sophomore and into my junior year of high school that I had begun to feel restless. It was the kind of restlessness that I could feel deep in my bones. Kind of like being stuck in between two big guys on a five-hour flight – not fun. I couldn’t tell why I felt that way but I just knew that I did. There was this girl Katie who sat next to me in homeroom. We became good friends because we had a lot of the same classes and we were forced to sit next to each other because her last name came after mine in the alphabet. She would occasionally invite me to come to XLT with her and I would politely turn her down or say, “Yeah … that would be fun” but actually have no intention of going. After a few weeks of her persistently asking, I finally committed and told her that I would go. At first it was nothing that I hadn’t seen before – praise and worship and a message. But, then something happened that I had never experienced. It made me uncomfortable because I didn’t understand it. It was the Eucharist. I sat there watching the whole auditorium kneeling before the Eucharist in adoration. My initial thought was, “I don’t know what that is, so I will sit here pray quietly to myself.” I didn’t want to kneel. The floor was hard. Leaving XLT, I had the feeling of being out of my comfort zone. I went with Katie the next week … and then again the following week. That piece of bread had the attention of a whole auditorium of people, it had to mean something. Unknowingly I followed her to a moment with Christ that would change my life. Before Adoration, the priest described what we were about to encounter. While I was sitting there, for the first time in my life I allowed myself to be found by God. And for the first time told him where I was. I heard him speaking in His quiet voice, “Stop looking. You are home”. This was that moment, when I found something that my life would be incomplete without. I can no longer see how a life can exist with out the Eucharist being at the center of it. Having a spiritual life with out the Eucharist at the center is like eating cookies without milk or trying to drive a car with no gas in the tank. It doesn’t work. When I was a senior in high school in 2003, I was received into the Catholic Church on Easter because of the Eucharist. There is not a day that goes by without the Eucharist being on my mind, challenging me and slowly molding me into the person I was created to be. The Eucharist is the one thing I am incomplete with out. St. Teresa of Jesus was born in Avila, Spain in the 1500s. She had tried to run off and be a martyr, but by the time she became a teen, all of that enthusiasm for the faith was gone. She had a passion for fancy clothes and jewelry and was known for being an excellent dancer. One of her favorite hobbies was reading romance novels and she made sure she constantly had a new one. God moved in Teresa’s life in a very unique way. She decided that she wasn’t content with the life she was living. She knew her happiness was elsewhere and chose to commit her life at a Carmelite convent and make her vows. She disciplined herself to spend time in quiet prayer developing a relationship with the lover of her soul. A life of poverty and prayer is what was in order and she remained faithful. Teresa reformed the Carmelite Order in these areas even though a war of insults and hatred was around her. 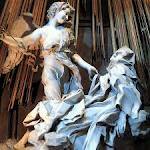 St. Teresa of Avila was a mystic as well. That means she was blessed with visions of Jesus and experienced things like her heart being pierced for love of God. She is also a Doctor of the Church because of her profound writings on prayer, meditation, and contemplation. Saint Teresa wouldn’t allow herself to be content with where she was in her spiritual life. She was full of life and enthusiasm, and while this drew people to her she had to come to the understanding that God had to be first and foremost in her life. When she put Him where He belonged, then God used her to do amazing things. Her Carmelite Order today is still benefitting from what this saint did. When God is first it doesn’t matter what other people think – because you know you’re doing what He wants. Christ's death and resurrection means we are invited to join God in his plan to redeem this broken world. It's not just a wishful idea; it's a call to every follower of Jesus to change the world. Dan Stevers - Change the World from Misael Cardenas on Vimeo. 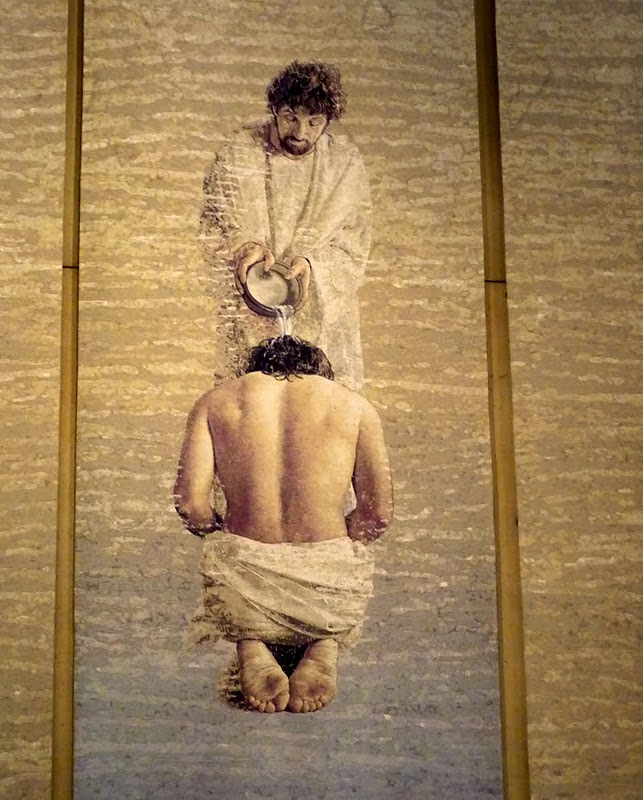 The Marianist religious vocation is a life of faith rooted in Baptism, by which we first began to live in Jesus Christ. We come together to form communities of faith, and we aim to share the same faith with our brothers and sisters. Perhaps the best way to prepare for Sunday worship is to read and ponder the scriptures you'll hear proclaimed at Mass. So, are you ready for this weekend? St. Augustine, Bishop of Hippo, church father, and according to his own words, the classic "bad boy" turned good (or at least turned toward God) was also arguably the Church's greatest theologian in the tradition of justice. In both his Confessions and The City of God, Augustine found the theme of justice a recurring one. While he denied that social justice was necessary simply to maintain order, Saint Augustine noted, in words that have become famous, "remove justice, and what are kingdoms but large-scale gangs of criminals?" In Augustine's commentary on Sunday's Gospel, he immediately focuses on the real point of Jesus' words--giving to God what is God's. Augustine insists that when we truly succeed in "giving to God what is God's," we are, in his words, "doing justice to God." "Doing justice to God." What a strange phrase. So, what could it mean? How is "doing justice to God" different from doing justice to others through our carefully calibrated legal system with all its checks and balances? In many cases, the end results may look the same. One big difference is that chasm that divides the "letter" of the law and the "spirit" of the law. Doing justice to God requires that we return to God, with dividends, that which God has entrusted to us. This is paying our dues to the Divine. "Doing justice to God" then, are the dues humans owe to God. This is a Feast celebrated in memory of the graces received by Father Chaminade at the shrine of Our Lady of the Pillar in Saragossa, Spain. Near the Shrine of Our Lady of the Pillar, Father Chaminade settled down to wait out his exile. Here he prayed and planned for his future work. And here he received from Our Lady a special message. He was to be Mary’s missionary. He was to found a society of religious who would work with her to restore the Faith in France. So vivid and detailed was the inspiration given to Father Chaminade, that years later he could say to his first religious, "As I see you now before me, I saw you in spirit at Saragossa, long before the foundation of the Society. It was Mary who conceived the plan of the Society. It was she who laid its foundations, and she will continue to preserve it." "The most just, most high, and most amiable will of God be done, praised, and eternally exalted in all things!" " A true Christian cannot live any life but the life of Our Savior Jesus. When we try to imitate Him the divine plan is carried out in our lives. The Blessed Virgin is our Model. She is a very exact copy of her Son Jesus. When we are devoted to Mary we will imitate Jesus." Each day the Marianists throughout the world consecrate themselves to the protection of the Blessed Virgin Mary. Like the beloved disciple, we accept Mary as a precious gift of God. Moved by Jesus' love for His Mother, we dedicate ourselves to her so that the Holy Spirit, in whose action she cooperates with a mother's love, may form us more fullly in the image of her Son. Inspired by your readiness to accept all of the wonders God would work in you, we offer you our desires to conceive in our hearts, bear in our lives, and bing forth into our world Jesus, Son of God, who became your Son for the salvation of all. Under your care, may we receive your graces of humilty and compassion; may our desires come to fruition, and may we lovingly echo your resposne to God; "Behold the servant of the Lord." May the Father and the Son and the Holy Spirit be glorified in all places in the Immaculate Virgin Mary. Amen. So, what's the origin of, ummm, Columbus Day? Nowadays, Columbus Day is sort of the Italian-American Pride on Parade Day. Kind of a kiss me I'm Italian day. Which is a nice. However, it conveniently omits the fact that even though he was born in Genoa, Cristoforo Colombo sailed for Spain, spoke and wrote in Spanish lived as a Spaniard and died in the land of Ferdinand & Isabella. He is buried in Santo Domingo Cathedral and his headstone lists his Spanish name -- Cristóbal Colón. Before Columbus was adopted by the Italian-American community, he was adopted by the entire American community. Columbus worship reached a high here after our War of Independence ended in 1784. After our wars with England (1776, 1812) we were looking for something non-English to hang our origins on. So Columbus was, dare I say it, discovered. The myth of a lone pioneer/navigator leaving the old world behind and discovering a new paradise far from Europe was a heck of a nice thing for American identity. So much so, that they named the area of their new Capital-- the District of Columbia. America’s first corporate identity character (pre-Statue of Liberty) was a woman in a toga named Columbia (Columbia Pictures swiped her as a logo). King’s College in New York wanted to shed its Royal English name after the war and so went native by renaming itself --Columbia. Columbus Avenue and Columbus Circle wouldn’t appear till years later when in the 1890’s we celebrated the 400th anniversary of the “discovery” of America. The first recorded celebration of the discovery of the "New World" by Columbus was in 1792. It was held by the Colombian Order here in New York. So, Happy Columbus Day to those who celebrate it. Actor Martin Sheen spoke in Washington, D.C. on Oct. 1 about his latest movie, which was filmed entirely along The Way of St. James, a European pilgrimage that leads to the city of Santiago de Compostela, Spain. “If this is the last thing I ever do, I couldn’t be happier,” Sheen told his audience at the Basilica of the National Shrine of the Immaculate Conception in Washington, D.C. The talk was part of a national tour to promote Sheen’s upcoming film, “The Way,” which opens Oct. 7. Sheen stars in “The Way” alongside his son, Emilio Estevez, who directed the film. “The Way” tells the story of an American doctor who receives news that his son has been killed in Europe while walking the Way of St. James. He decides to finish the pilgrimage in his son’s place. “In the journey, he becomes himself,” Sheen said. Sheen explained that as the pilgrimage progresses, the characters are forced to unload the things that burden them, both physically and spiritually. “The real pilgrimage starts to take place on the interior,” he said. Sheen also gave the audience a brief history of his own spiritual growth. He explained that he was born Ramón Estévez. When he moved to New York to pursue acting, he found himself faced with racial discrimination and decided that he needed a stage name. He chose the last name “Sheen” after Archbishop Fulton J. Sheen, whom he described as having an “extraordinary presence” in his household when he was young. “I grew up watching him,” Sheen said. “I thought of him as this magnificent actor,” he explained, recalling the archbishop’s sharp sense of humor. Sheen challenged his audience to evaluate their lives in terms of how they can serve those around them. “There remains a very real and mysterious yearning deep within each and every human heart that compels us to reach outside of ourselves and serve others,” Sheen said. There's a great wedding reception in this coming Sunday's Gospel and an invitation to a lavish feast in the day's first reading, taken from Isaiah. The first scripture reading this weekend describes a great feast and its menu but the greatest offering here is something much greater than the specials! The Gospel tells the story of a wedding and who's invited, who shows up and who gets bounced. The king in the story first invited the worthy, who proved themselves unworthy, and received worse treatment than the lout who was later tossed out. Then the king called everyone to the wedding feast. Many came, thankful to be there and happy to uphold the necessary standards. And one guy got tossed. Lessons to be learned: First, all people have been invited to the table. God, the true king of heaven, invites us - the good and the bad and the in between - to his heavenly affair. We are all called, all invited and all urged to ready ourselves for the heavenly banquet. Second, there is a dress code, and we better not forget it. The ticket is free, but we better know what to wear. This means donning the garments of salvation and the righteousness of Christ, because if we expect to attend this affair with the rags we have in our closets of self-importance, self-righteousness, self-conceit, we'll get bounced out of the event on our cans. God's invitation, as extravagant and as open as it is, carries responsibility. The kingdom model is outward, inclusive, welcoming, beckoning, inviting and open. It is also about service, not about being served. God is calling us to be his guest. We'd be wise to show up. Today the Church commemorates the feast of Our Lady of the Rosary, a celebration that has its origin not, as it would seem, in simply a prayer, but in a battle. On October 7th, 1571 a fleet of ships assembled by the combined forces of Naples, Sardinia, Venice, the Papacy, Genoa, Savoy and the Knights Hospitallers fought an intense battle with the fleet of the Ottoman Empire. The battle took place in the Gulf of Patras located in western Greece. Though outnumbered by the Ottoman forces, the so-called "Holy League" possessed of superior firepower would win the day. This victory would severely curtail attempts by the Ottoman Empire to control the Mediterranean, causing a seismic shift in international relations from East to West. In some respects, and I do not want this claim to be overstated, the world that we know came into being with this victory. This event is known to history as the "Battle of Lepanto." Pope Pius V, whose treasury bankrolled part of this military endeavor, ordered the churches of Rome opened for prayer day and night, encouraging the faithful to petition the intercession of the Blessed Virgin Mary through the recitation of the Rosary. When word reached the Pope Pius of the victory of the Holy League, he added a new feast day to the Roman Liturgical Calendar- October 7th would henceforth be the feast of Our Lady of Victory. Pope Pius' successor, Gregory XIII would change the name of this day to the feast of the Holy Rosary. Our contemporary sensibilities might make us stir uncomfortably at the association of the Mother of the Prince of Peace with the memory of warfare, strife and the troubled history that preceded and followed the Battle of Lepanto. But the fact of the matter is that this feast was first understood as a celebration akin to what we commemorate on the Fourth of July or D Day. Pope Pius V (later Saint Pius V) interpreted the event as the movement of Providence in favor of the Church and European civilization. He had no qualms in the assertion that the triumph properly belonged to the Mother of God and that in the midst of the rancor of battle, her intercession had moved the "Holy League" to victory. Such warlike associations with Christian Faith and culture likely cannot be sustained today. Some find all this to be offensive to genuine Christian sensibilities. Thus, the true history of this day has receded into the obscuring mists of the past. In our present circumstances we celebrate the prayer of the Rosary, not the battle of Our Lady of Victory. We recall its efficacy as a source for meditation and contemplation and encourage its practice. If there is reference to a battle at all, it is made to the conflicts of our interior lives, particularly in our desire to pray without the burden of distractions. And yet I find my thoughts turned towards Our Lady of Victory, of the Mother of the Messiah, who proclaimed God mighty and victorious in her Magnificat, and in these words spoke of the strength of His arm to cast down the mighty and exault the lowly. I think of all those precursors of the Mother of God- Miriam, the prophetess, who took a timbrel in hand and on the shores of the Red Sea, singing songs in praise of the God of Israel's triumph over the army of Pharoh; of Judith and Deborah and the fire that burned within their hearts for justice and the sword that they raised against the enemies of God's people; of Rahab and the spies and the fall of Jericho; of Esther the Queen, who risked her own life so that her people might be saved. The Bible is a book of battles. There is properly a peace making quality to our Biblical Faith, a hope for a restoration of the concord that the Creator intended between himself and humanity. But there is also a properly oppositional quality to our Faith, the recognition that in knowing what we stand for, we also know what we stand against. We can no more excise conflict from the Bible than we can deny its reality in our own history. We have been placed in the midst of a fallen world, not merely to surrender to its failure to love, but to live in defiance to that which opposes God. Resist we must, but to do so, we attempt to imitate, not the fallen powers of this world, but Christ the Lord, who wrested power away from the powerful, not by force of arms, but in the strength of his will to love us unto death. He is triumphant, but there still are battles left for him to fight in all the Lepanto's that rage within our own troubled souls. In the midst of these battles I know that Christ the Lord fights for us still, and that the Lady of Victory is at his side. “One day when Francis went out to meditate in the fields he was passing by the church of San Damiano which was threatening to collapse because of extreme age. Inspired by the Spirit, he went inside to pray. Trembling with fear, Francis was amazed at the sound of this astonishing voice, since he was alone in the church; and as he received in his heart the power of the divine words, he fell into a state of ecstasy. Returning finally to his senses, he prepared to put his whole heart into obeying the command he had received. For the record, the moment recounted above took place in 1204... yet then as now, the call of the Cross remains the challenge of our time. So as the work continues, and another St Francis' Day has passed, may we all ever just keep on, keep trying and -- flaws, faults, warts and all -- keep building. These are exciting times for the Marianist Province of Meribah. Our schools are thriving, there are so many active parents and alumni supporting our mission, and we have three new Marianists in formation – we are indeed very blessed. I was speaking with one of our students yesterday who used an interesting phrase, “I can now accept that I might have a vocation.” It is indeed something we have to come to terms with over time, and it’s not easy! This week the first readings at daily Mass share the story of Jonah that we studied freshman year. Remember him? He was called to spread God’s message but instead got on a boat and headed in the opposite direction. No way God, not me! Ultimately, though, God’s will be done. We can’t hide from God (think about the absurdity and comedy of Adam and Eve trying to do so in the Garden of Eden…) and the more we try to ignore his plan for us, the less settled our hearts will be and we will find our lives less fulfilling, less complete. Jonah brought about a great conversion in Nineveh, he literally changed the world and we can do the same if God chooses us as his instruments and we accept. In the Gospel story of Martha and Mary we are told that Martha was anxious and worried about many things…I think anyone discerning a religious vocation can probably relate! Our challenge, and it is a great challenge, is to find solace with Jesus and, like Mary, know that everything will work out in God’s own time, as tough as relinquishing that trust might be some days! I encourage you to pray with the Bible, through it I am sure you can relate to many of our forefathers in faith. Likewise, the lives of the saints offer further stories of people, like us, who have struggled with a vocation in their own lives – and prevailed! Today, October 4, is St. Francis Day! This is the day we haul our pets for the annual Blessing of Animals. Perhaps this song with its lyrics below would suffice rather than leading our companions on this road to a blessing. Any pet offers us the opportunity for companionship. And it’s God who planted this desire for companionship within us and that’s because God desires companionship with us! God desires us - and we are made to desire God. Every relationship we have, every love that is ours, is a companionship given to lead us to God.